Genomics research has made significant advances in recent years. In Genomics: Essential Methods, a team of internationally-renowned researchers share the most up-to-date information in a field that has in recent years switched emphasis from gene identification to functional genomics and the characterization of genes and gene products. This volume approaches this complex subject with a broad perspective to supply the reader with a vital overview of genomics and its derivative fields, with a focus on pivotal issues such as data analysis. 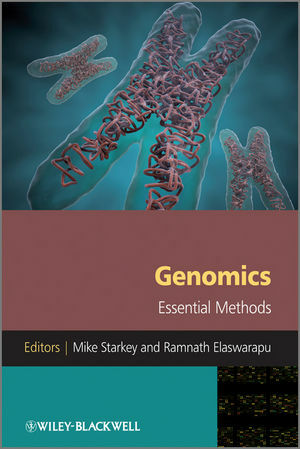 Expansive and current, Genomics: Essential Methods is a comprehensive research guide that describes both the key new techniques and more established methods. Every chapter discusses the merits and limitations of the various approaches and then provides selected tried-and-tested protocols, as well as a plethora of good practical advice for immediate use at the bench. Dr Mike Starkey, Animal Health Trust, Newmarket, Suffolk, UK. Dr Ramnath Elaswarapu, Oxford Gene Technology Ltd, Yarnton, Oxford, UK. 1 High-Resolution Analysis of Genomic Copy Number Changes (Mario Hermsen, Jordy Coffa, Bauke Ylstra, Gerrit Meijer, Hans Morreau, Ronald van Eijk, Jan Oosting and Tom van Wezel). 2 Identification of Polymorphic Markers for Genetic Mapping (Daniel C. Koboldt and Raymond D. Miller). 3 Genotyping and LOH Analysis on Archival Tissue Using SNP Arrays (Ronald van Eijk, Anneke Middeldorp, Esther H. Lips, Marjo van Puijenbroek, Hans Morreau, Jan Oosting and Tom van Wezel). 4 Genetic Mapping of Complex Traits (Nancy L. Saccone). 5 RNA Amplification Strategies: Toward Single-Cell Sensitivity (Natalie Stickle, Norman N. Iscove, Carl Virtanen, Mary Barbara, Carolyn Modi, Ari Baratz, Toni Di Berardino, Ellen Greenblatt, Ted Brown and Neil Winegarden). 6 Real-Time Quantitative RT-PCR for mRNA Profiling (Stephen A. Bustin and Tania Nolan). 7 Gene Expression in Mammalian Cells (Félix Recillas-Targa, Georgina Guerrero, Martín Escamilla-del-Arenal and Héctor Rincón-Arano). 8 Using Yeast Two-Hybrid Methods to Investigate Large Numbers of Binary Protein Interactions (Panagoula Charalabous, Jonathan Woodsmith and Christopher M. Sanderson). 9 Prediction of Protein Function (Hon Nian Chua). 10 Elucidating Gene Function through Use of Genetically Engineered Mice (Mary P. Heyer, Cátia Feliciano, João Peca and Guoping Feng). 11 Delivery Systems for Gene Transfer (Charlotte Lawson and Louise Collins). 12 Gene Therapy Strategies: Constructing an AAV Trojan Horse (M. Ian Phillips, Edilamar M. de Oliveira, Leping Shen, Yao Liang Tang, and Keping Qian). 13 An Introduction to Proteomics Technologies for the Genomics Scientist (David B. Friedman).